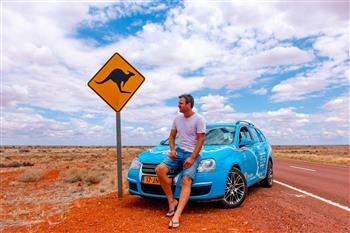 Traveler Wiebe Wakker has driven over 89,000km across 33 countries for over 1,000 days behind the wheel of a modified, electric Mk V Golf Wagon, nicknamed the Blue Bandit. Normally, there are must-haves for any long journey: money, accommodation and, for those traversing remote areas, fuel; but for world traveler Wiebe Wacker, founder of the Plug Me In project, he took none of these things with him when he set out for Australia from the Netherlands in 2016. Rather, Wiebe loaded up the Blue Bandit, a customized Mk V Golf Wagon fitted with an electric motor good for 200km, and hoped to rely on the kindness (and power) of strangers. All of this was accomplished via the goodwill of supporters who gave Wiebe somewhere to stay, and his trusty steed a much-needed charge, along the way. That's a lot of free meals and electricity. Within that three year period Wiebe also documented his travels via social media, as well as meeting with various companies, government bodies and media outlets to learn more of the work being done on sustainability in each of the regions he visits; sharing ideas and experiences. The car itself, the Blue Bandit, is a lightning rod for tales on the road. Long before the advent of electric powerplants, the Bandit started its life as a standard petrol Mk V Golf Wagon before getting the custom treatment. "[The car] was originally a project by a Dutch utilities company who wanted to have electric cars to research Vehicle 2 Grid technology. Because there were no factory EVs who had this technology at that time they decided to convert 50 Golfs to electric. This was back in 2009 so these are one of the first generation EVs," Wiebe explains. "The engine and fuel tank have been replaced by an electric motor and battery. The capacity of the battery is 37 kWh which gives a range of 200km. The motor is 150 KW, and good for a top speed of 180 km/h." Currently in Adelaide, Wiebe is making his final charge to Sydney, and plans to arrive in the Harbour City in April.